1. Invest in quality tailored clothing that will last. Buy conservative suits and basic trousers that won’t be out of style next season, and use fashion dress shirts and ties to personalize your fashion statement. 2. Find a good tailor and treat him/her well. 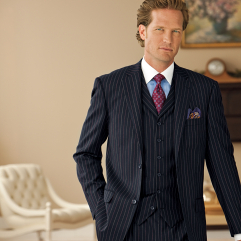 Proper alterations on suits, trousers and sport coats are important to your appearance. 3. Be a bit more adventurous when matching shirts and ties. A large patterned necktie will work very well with a small patterned dress shirt, and vice versa. For example, pair a bold paisley tie with a micro-check dress shirt. 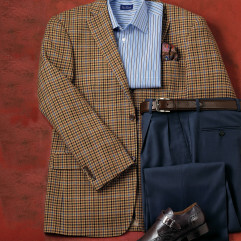 Some simple rules for coordinating your dress shirt with a tie, sport coat, or suit. 1. Avoid patterns that are too similar. 2. Select complementary colors and patterns. 3. Don’t wear combinations that are drastically different. The patterns and colors should not compete with one another. 4. Match large patterns with small patterns or vice versa. 5. Don’t overdo one pattern or color.